Modern fans of the show therefore have no idea just how lucky they are with the current crop of tie-ins. Back in 1966 we would have killed for a Cyberman (I made one from my Action Man), a Yeti or an Ice Warrior, let alone a minor character like the Moxx of Balhoon. 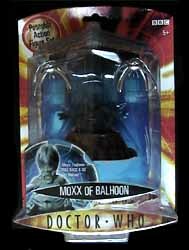 The Moxx of Balhoon action figure - and two attendant robot spiders - is a really nice character toy and although I can't imagine getting much play value from him I'm still sure that there will be plenty of young fans, as well as old, who will be welcoming the spitting blue alien into their lives. 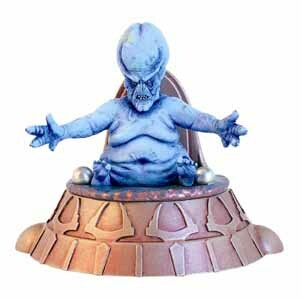 Welcome Moxx, you bring the gift of collectable pleasure.